When it came to my turn to choose a recipe for Project Pastry Queen, the task wasn’t an easy one. Though, I felt drawn to this recipe. See, when I was a little kid, I used to tan beautifully in the summer. Golden brown skin and never a sunburn, thanks to my Italian heritage. Things are different these days since my Irish heritage seems to have taken my skin hostage, leaving me lily white each summer due to the massive amounts of sunscreen I need to use. Nonetheless, my mom used to call me “peaches ‘n cream,” a nickname I hold close to my heart. So naturally, the Fredericksburg Peach Cream Cheese Tart was the perfect recipe for me to choose. Goodness how happy I am that I chose this recipe. Peaches are finally in full swing here in CT and I took a special trip up to a farm stand today just to pick up a few. I couldn’t, in good conscience, use grocery store peaches that are shipped in from either Georgia or California for this dessert. Not when I could get local ones. Plus, my farm stand trip gave me a good excuse to day a drive on this A+ summer day on some beautiful back country roads. In short, we l.o.v.e.d this tart!! The cream evokes a feeling that you’re eating peachy cheesecake and while I thought cinnamon-sugar coated peaches would be too sweet of a complement to the cream filling, I was wrong. 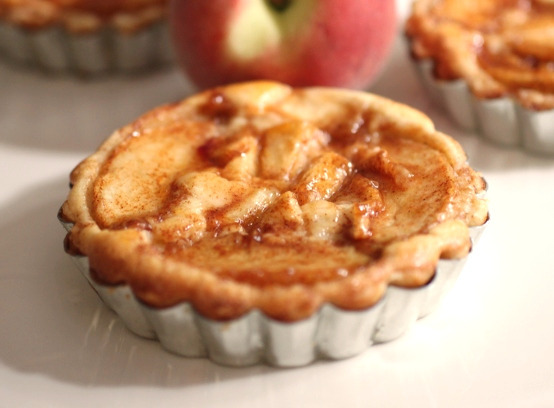 They are the perfect topping to these pretty tarts. I think what I’m most excited about (aside from eating them, of course) is that even though I halved the recipe (full recipe below), I was able to freeze enough leftover dough to make another four little tarts come apple season. Score! If you’d like to make individual tarts (six 4-inch tarts) rather than one large one, simply roll out the dough and cut out rounds to fit your tart pans. I would recommend slicing the peaches into 1/4-inch slices and arranging them on top of the filling, then sprinkle them with the fruit topping. The weight of the peach halves will be too heavy for the smaller tarts and it will cause the filling to overflow the sides of the pans. Bake the tarts for 25 – 30 minutes before checking for doneness – they may need more time – the centers should be mostly firm (like a cheesecake) to the touch and the edges should be lightly browned. Using a mixer fitted with a paddle attachment, mix the flour, salt, sugar, and lemon zest in a large bowl on low speed about 30 seconds. Cut the chilled butter into 1/2-inch pieces. Add the butter to the flour mixture and combine on low speed about 1 to 1 1/2 minutes, until the mixture looks crumbly, with bits of dough the size of dried peas. Whisk the egg with the cream and add to the flour mixture, mixing on low speed until the dough is just combined. Continue mixing for 10 seconds longer. If the dough is too dry to form a ball, add more cream, 1 tablespoon at a time. Gently mold the dough into a disk, wrap in plastic wrap, and refrigerate for at least 1 hour. Roll the dough out to 1/8-inch thickness on a generously floured flat surface. Fold it over the rolling pin and gently transfer the dough to a 10-inch tart pan. Press it lightly into place. Using a mixer fitted with a paddle attachment, beat the cream cheese and sugar in a large bowl on medium speed until fluffy. Add the mascarpone and vanilla and beat on medium speed until combined. Add the eggs and beat on medium-high for about 1 minute. Add the flour and salt; mix on low speed until combined. Spoon the cream cheese mixture into the unbaked tart crust. In a medium bowl, stir the cinnamon and sugar together until combined. Peel and pit the peaches, or peel and core the apples or pears, and cut them in half. Score the outside of each half diagonally from top to bottom, starting at the top left corner and making 3 evenly spaced lines ending at the bottom right corner. (Score only 7 halves. The remaining fruit will be diced later.) Repeat with three scores, starting at the top right corner and extending to the bottom left. Coat the fruit in the cinnamon-sugar mixture. Arrange 6 halves around the outer edge of the pie. Place the seventh half in the center. Cut the remaining fruit in 1/2-inch dice and coat with the remaining cinnamon-sugar mixture. Spoon the diced fruit into the spaces between the fruit halves so that the cream cheese filling is completely covered. Bake tart for 50 to 55 minutes. About 10 minutes before the tart is finished baking, stir the apricot jam, brandy, and water together in a small saucepan set over medium heat. Continue heating until the mixture thickens slightly, about 5 minutes. Remove the tart from the oven and brush the glaze over the top. let cool at least 1 hour before serving. When completely cool, this tart may be tightly covered and refrigerated for up to 2 days. Serve at room temperature. Mmm, looks so good! I think I’ll slice my peaches next time after seeing yours. I also can’t wait to try it with apples come fall! I’m hungry just thinking about it! These look amazing! I love peaches and peach pie. Peach pie with cheese. Yum. It was so good to meet you yesterday at the Big Summer Potluck! Hope to read lots of wonderful posts here and to see you next year! Love your blog. It’s funny, I have the same skin thing you do! I’m also Italian/Irish, and I used to tan beautifully in the summer. Now I just burn and then burn some more. What the hell is that? i ran out of time to get this done by today but will catch up this week… how many mini tarts did you end up with halving the recipe? Ashley, the halved cream recipe yielded enough for 4 tarts (minus a tbsp or two I removed from the tarts when I realized they were going to spill over) and the halved tart dough recipe yielded enough for 8 tarts. It was so strange to have so much dough leftover but I ended up freezing the half of it. I love the individual tarts. And I can’t wait to make this again this fall – I think this is going to be my Thanksgiving dessert this year. Growing up in San Antonio, a stone’s throw from Fredericksburg, there isn’t a peach on earth that compares to the ones you find there – at least in my book. Not gonna lie, as the photo loaded, I may have drooled a little bit. Or a lot. Cut me a break, I haven’t eaten breakfast yet. I love any and all things peach, and I will definitely be making this. It was lovely to meet you on Saturday! lol Amber! You’re too funny. I don’t at all doubt the peaches down that way far surpass what we get up here and frankly, I’m a little jealous. 😉 It was so great to meet you too on Saturday and I’m already looking forward to the next event. GREAT choice, Tara! When I first bought the cookbook, this recipe made my jaw drop it looked so good, and I can’t believe it took me this long to make it. Love your mini tarts – so cute!! Oh gosh we are loving the flavors in this recipe! The lemon crust, cream cheese filling and cinnamon peaches!? Amazing! Can’t wait to try these! 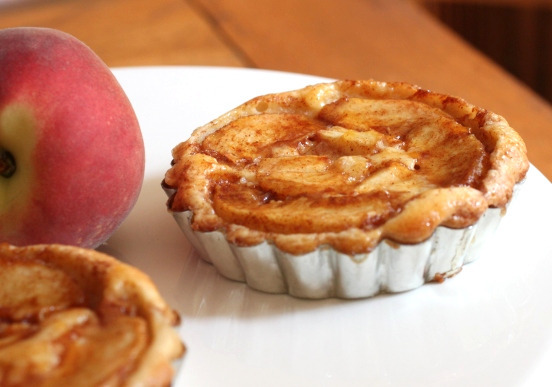 I can’t even describe how wonderful these peach tarts look, I love the ingredients, MMMMM! These are beautiful! In fact, we were looking for something to do with all our leftover peaches. YUM! I’ll take a dozen please. Thank you. The photos are gorgeous! This looks out of this world. Just heavenly. A little slice of summer. YUM! WOW – these look absolutely amazing!! A perfect dessert to serve at a dinner party for 12 or 2. Thank you for sharing. Oooooh these look mouthwateringly delicious. I SO can’t wait for peaches to come back into season here. I’ve been craving them for a while now and seeing this hasn’t helped. Um. This looks so delicious I just want to eat it right off the screen! I’ve never done a tart like this before, but I think I’m going to have to try this one! Aww, those are such sweet little tarts! The combo of cream cheese and peaches sounds amazing; will have to try it =). Gorgeous tart…Lucky with your Italian heritage there, mine is French (but the strange red haired and pale sort 🙂 I so love peach in dessert dishes, just lovely! What a wonderful mix of flavours. I love this. Peaches and cream…. Match made in heaven. Lovely post and lovely pictures. can you tell me if there is any difference when also adding blueberrys? i had the most amazing peach blackberry cheese tart very similar to this i want to imitate. Do i just add the blackberrys along w the peaches? Sarah, I think you can definitely add blueberries. I have a peach-blueberry crumble buried in my archives and it’s a great combination. Let me know how it turns out for you! Hi! I love this recipe, it’s fantastic. I’ve made it twice, but each time I diced the peaches because I didn’t understand what you meant by scoring them. I plan on making this tomorrow, and would really like to try it with the scored peaches. So can you please explain what scoring means, and how to do it? I get confused when reading the recipe. I’m visual, so pictures would be amazing. Thank you so much! I’m in love with this tart! I made this with small individual tins and the peaches ended up hard. Should I bake them for a certain amount of time or maybe lower the temperature so the peaches come out softer? I may have cooked them too fast. There’s a note about baking time for smaller tarts at the top of the recipe. I’m not sure how long you baked them for but it sounds like that may have been the issue.